In a previous post I questioned why William Slaughter was missing from the 1891 census. Had he thrown himself into his ever-expanding and demanding business after the tragic death of his wife, leaving his sister to care for his young family? Perhaps he was simply away on a business trip at the time of the census. From the account of his working life in the book on the history of the firm that he founded with William May [Slaughter and May, A century in the City by Laura Dennett, published by Granta Editions in 1989] he was known as a very driven man, who would be called a ‘workaholic’ nowadays. He had to have time off occasionally due to nervous exhaustion, but he also managed to take extended holidays, sometimes abroad. In the 1890s William sometimes travelled on behalf of his clients to the United States and to the continent. He had a passport issued in 1888. His name appears on the passenger list for the Mauretania when the family arrived on the 30th January 1908 from New York. William was accompanied by his wife, Hester, his son Arthur [aged 22] and daughter Olive . Interestingly, William is also recorded as having crossed the Mexican –US border in 1907, but I have been unable to find our further details concerning this trip. 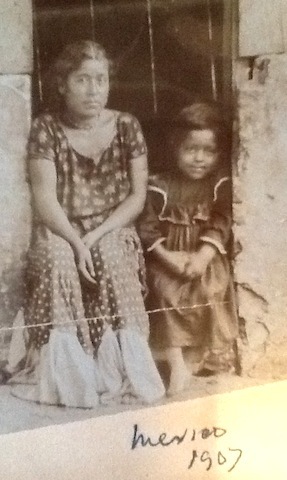 In my grandfather Arthur’s battered photograph album there are several pictures labelled Mexico 1907, including some that look like factories under construction or sugar mills. It is hard to believe they were just holidaying and sightseeing. Perhaps William was looking at the sugar industry in Mexico as part of his extensive business interests? In the 1911 census William’s surname has been transcribed as Llaughter. He was living in his flat at 3 Berkeley House, Hay Hill, Berkeley Square, alone apart from his butler, cook and housemaid. But where was his wife? Further research revealed that she was at 50 Beaumont Street, London, described as a visitor/resident aged 42. This was a nursing home run by a Matron, Clara Bennett, and two nurses. There were five female residents/visitors. I do not know what was the matter with Hester, but she must have made a good recovery for she lived for a further thirty- three years. As a footnote,I have been told by an Irish friend that Mihill is the Northern Irish for Michael, so that helps explain the origin of the name. Perhaps that is where Mary Mihill or her family came from? Obviously more research is needed! It is very tough to know what to do about these gaps. I worry that too much speculation about what an ancestor might have been doing makes the narrative seem flimsy and insubstantial. Have you checked out all the passenger lists on line? I found my ‘narrator’ going to Canada via Boston, with his wife and mother-in-law to visit relatives which was interesting, but the downside is ‘I/he’ have no idea who or where!